Today was one of those days where you want to run away and hide from your kids. The kids who don't stop asking for things or yelling at each other over who gets to sit where on the couch. It was one of those days where no matter what tactic you tried, they refused to listen. I was nice, I was mean, I tried bribes, nothing. It was as if I was talking to the air. I have never been happier for bed time. Now I get to sit with Ella, admire her little fingers and toes and stare into space. I love my boys, but spring break couldn't of ended at a better time. Speaking of little fingers and toes.. A lot of people meet Ella for the first time and when they hear she has Down syndrome they are shocked. They tell us they don't see it and ask how it was diagnosed. It was officially diagnosed with blood work called Karyotyping, but when she was born the dr or nurse (I have no idea who saw the signs first) thought she might have it based on her eyes, her pinky fingers and her toes. 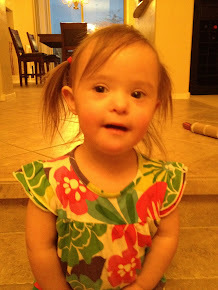 I guess that often, Down syndrome babies will have pinky fingers that curve inward and Ella sure does have that. The other sign is called "sandal toe" when a Down syndrome baby will sometimes have a greater space between their big toe and the next one, like where the strap of a sandal would go. I don't see this one at all. Her toe spacing looks very normal to me. Compared to my toes which seem to have a very large space between the first and second toe, Ella looks almost like there isn't enough space, but the Dr. assured me that she has the space, so I believe her and moved on. The other thing is her eyes, they are more almond shaped and slant a little upward at the corners. I love her eyes, regardless of the shape or slant. Right now her eyes are the only way I can tell how she feels (she likes to squint and grunt when she is mad and when she is happy she refuses to shut her eyes, even if she is dead tired) and when they are open they are so clear and big that I just can't stop staring into them. I love her eyes, toes and fingers, even though they make her different, they make her so darn adorable. Today was World Down Syndrome Day. I wish I could say we did something to help raise awareness of Down syndrome, but if you read paragraph one of this post, you would see Ella's big brothers made our day a little challenging and the only thing we raised awareness of was how many times I could take away Super Mario Brothers for the Wii before I was taken seriously (4). I feel bad, like I should have done something to make this day count for Ella, but I didn't know what to do. I am thinking that at only 4 weeks old, I can let this one slide but next year will be different. One last thing I have been wanting to share. People constantly ask us how we have been able to handle this so well so soon. For us, finding out our baby has Down syndrome was no different than someone else finding out their child has autism or sending your teenager off to school one day and they get in a car accident and are severly injured. The initial news is hard to process, very hard. As a parent you never, ever want there to be anything wrong with your kids. We would all be kidding ourselves though, if we think that you can raise a child without there being a moment where something happens that is so horrible that it makes you want to roll into a ball and cry for them and for you. Whether it happens at birth or 20 years later, every parent will be faced with a challenge that won't be welcomed. Maybe it isn't health related, maybe it is a developmental delay or maybe something like seeing your child experience rejection for the first time, but there will come a time when you wish it wasn't happening to you and your family. It is how you handle this moment, this experience, that matters. You might run away from the problem at first, you might throw a fit or break a window with your fist because you are so angry, but when you are done experiencing the pain of the initial shock, you just have to pick yourself up and get on and that's what we have done. My new favorite saying is "It is what it is". I can't change what God has given us, I can't pray every night that Ella will wake up and be free of her diagnosis because that would be useless. All I can do is accept it and accept her. That is how we get by, by knowing our situation isn't unique and by accepting everything that is thrown our way, whether we like it or not.